Retro consoles like the NES Classic Edition and the Super NES Classic are so much fun, but they’re not the only source of Nintendo nostalgia out there for gamers. 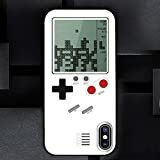 If you were a Game Boy fan back in the day, you absolutely need to get your hands on a Baecon Pet Tetris Game Phone Case for Apple’s iPhone X. It doesn’t just look like a Game Boy, it actually has a real screen, real controls, and an actual Tetris game that you can play! It’s a ton of fun, and it’s only $16 on Amazon. With the retro design of GB, you can have a Russian box at home or in the office anytime and anywhere, and instantly become the focus of the game. High-quality sturdy TPU material to effectively protect your cell phone to prevent falling and collision. Built-in ultra-thin electronic displays and controllers. Free classic games such as Tetris, Snake, etc . ; built-in button batteries. There are two colors available for you to choose from. Please confirm your phone model before purchasing and avoid any mistakes. Turn your phone visually into a retro console with the phone case in a fun Nintendo outfit. The mobile phone case convinces with its funny style.